Scientifically, it has been proven that the human skin changes over time, which is why something as simple as changing your soap can make a big difference in results from a skin-care routine. 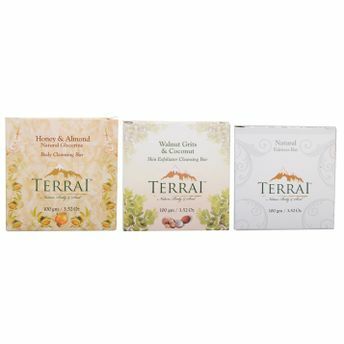 Terrai soaps are formulated using Coconut Oil and other natural ingredients that are not harmful for the skin. Each soap is specially formulated and blended with natural active ingredients that ensure satisfactory results. Terrai Honey & Almond soap is a natural transparent glycerin soap with a distinctly exotic and very fresh scent that not only feels wonderful, but its non-drying formula rinses off easily. This pure glycerin body cleansing bar contains the goodness of Almond Oil and Honey with Natural Extracts and Sugar crystals. Terrai skin exfoliating scrub soap is made using fine granules of walnut grits, that are gentle on the skin, removing debris while leaving the important emollient layer of the skin behind so the skin remains soft and supple. It is a skin treatment solution containing Zinc Oxide that works as a mild SPF and helps form a protective layer against the harmful rays of the sun. Titanium Di-Oxide helps in natural fairness by effectively removing skin pigmentation, dark spots and blemishes.